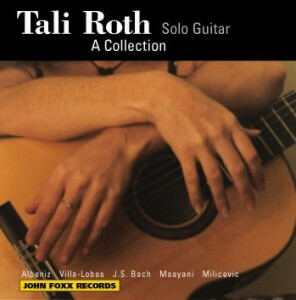 Guitarist Tali Roth presents a selection of Piazzolla’s works, in their original versions and in new, challenging arrangements for solo guitar; guitar and violin; or guitar, violin, and double-bass. Described as “extraordinary” by Classical Guitar magazine, Tali’s engagements include recording all of the classical guitar pieces for the Woody Allen film You Will Meet A Tall Dark Stranger, released in 2010. Since her Carnegie Hall debut she has performed as a soloist throughout the US, Canada, Europe, Latin America, Japan, and her native Israel, appearing at Lincoln Center’s Alice Tully Hall (with violinist Midori) and the Alvin Ailey Theater, among others. A review from El Once Tango News is available here. A review from Tango Reporter is available here. Click on the links below to hear tracks from the CD.